This is an excerpt from an article that appeared in the June, 2011 issue of The Art of Mary Jane Magazine. Subscribe today for the best of Mary Jane girls and stoner culture. America, the beautiful! From sea to shining sea this land of ours remains one of the most magnificent on the planet, and always made more magnificent when enhanced with a few puffs of kind bud – but make sure you know what kind of town you’re in before you light up, or you might find yourself with shwag weed, or even worse, cooling your heels in the local lock-up. Let’s examine the best cities in the country for scoring, smoking, and steering clear of the law. We will be attending a Pre Oscar party with MBL Group International for an epic forum of fashion. The highlight of the event will be showcasing high end crafted gowns with Anya Bykova a fashion model extraordinaire with fashion designer Martionii Black Label . It is our pleasure to present to you this amazing showcase with MBL-couture with an essence of styling. This event is going to be an epic fashion show of desire for the hottest high end crafted gowns. The MBL Group International/MBL-Couture is dedicated to showcasing the highest standards in fashion for A- list celebrities in Hollywood for events including the legendary Oscars and Golden Globe Awards. Anya Bykova who is a very talented model and actress will be taking center stage to show the pinnacle of high fashion debuted by MBL Couture. Anya is truly dedicated, she loves the art of performance with a taste of sophistication and class defined by her beauty through the very essence of desire through the eye of a lens. This amazing company creates magnificent master piece gowns for actresses, with unique hair styles along with high end handbags and shoes that will be the highlight of this amazing pre oscar party. MBL-Couture has partnered with legendary companies such as Versace, Christian Dior and Louis Vuitton. Every single fashion piece is created with the highest level of craftsmanship with all products created in the United States. Our magazine will be getting exclusive access to this amazing epic Pre Oscar party. We were so excited to see Anya with a golden vaporizer on her latest glamour fashion photo shoot, check it out at http://www.anyabykova.com. This latest shoot can show you that she loves her vaporizers http://www.mbl-group-international.com. This world of high end fashion meets sophistication and class with celebrities attending to have the first view of MBL-Couture’s new line. Vaporizers are now becoming a hot look with celebrities and high end models-STAY TUNED IN FOR AFTER PARTY HIGHLIGHTS. Racquel Knight is the Editor of The Art of MaryJane magazine. You Say You Wanna Vapolution? Well here we are, into the Christmas and Hannukah shopping season, and searching high and low for that special 420 gift for your favorite stoner. Bear in mind, people who partake of the herb are not addicted to smoking some sort of harmful substance. In fact, many people are getting away from smoking altogether, because now it’s not necessary. There are plenty of ways to get the goodness that Cannibis Sativa has to offer from vaporizing the weed – without smoke, without carcinogens, and especially without tar. The active ingredient in marijuana is readily available by this slow, controlled heat that vaporization has to offer. So consider the gift of high, along with the gift of good health, and consider a vaporizer for your loved one. Today we’re looking at the Vapolution. This device is kind of inconspicous, looking a bit like one of those small propane cylinders for a camp stove. It even comes in green! The kit itself contains two bowls which utilize glass on glass heating along with two whips (tubing for inhalation) Home and car power adapters are included as well. Given the most consumed or broken parts are doubled, this is a huge plus in the package! Bowls are thin glass in most vaporizers and with misuse can easily be broken. Use care when filling. So, time for a test. I followed the instructions carefully, noting that unlike most vaporizers, grinding of the herb is NOT recommended. The makers actually want you to use a small bud or two and leave them whole. 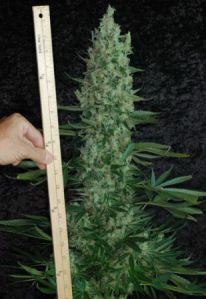 While this is a huge convinience, as most people consider a grinder a must, I wondered whether I would get all I could get out of each bud the way I did in other vaporizers, where you’ve maximized the surface area and exposure of the pollen. So now, with the bowl loaded, I found attaching it felt like a risky proposition. Here I am jamming glass into this hard surface and I felt like I might break it. I used care, and it worked fine. My concerns about breaking the bowl may be founded because they did give you a second one in the kit. Connecting the tubing (whip) to the bowl also felt a little stiff. In a rare RTFM moment, I discovered that you can heat the bowl in hot water to make connecting the tubing, a one-time proposition, easier. Vapolution does give you a one-time unit replacement, no questions asked, for $50. Okay, with that behind us, I found the unit’s controls allowed vaporization range from barely there to burning. Somewhere near the 2 o’clock setting on the dial was vapor bliss. Good stuff, and I do feel – as I initially suspected – that I might not get all I can out of each bud without it being ground. Remember, though, that with vaporization your herb can still be smoked, or used for baking AFTER vaporization. There is still plenty of active ingredient in there to use again. 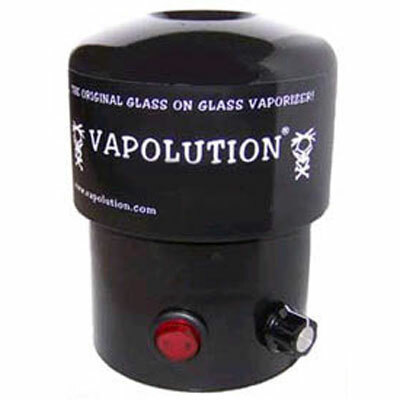 Cons: Parts are very fragile, need to take care when assembling and use;temptation to combust herb, because you really are only vaporizing the exterior; lack of “wow factor” – this performs like many whip style vaporizers, albeit a very very good one. If the box-tube whip style vaporizer is what you are after, this one has it in spades. Bobbie Carson writes about marijuana culture and Mary Jane girls.